ALLADVANTAGE Program(get paid to be on the net, no fee you sign up free Sign My Guestbook Please do not close the Tripod pop up window instead minimize it so when you got to another section of this page it will not pop up. 4/15/2K- The following comes from Bigwiggle250. "Norman Smiley's four costumes will be riot gear, a baseball uniform, a hockey goalie uniform, and a football uniform. There will be 25 wrestlers in the game (which leaves 23 unnamed) made 4 different ways, meaning with 4 different costumes. Also WCW 2000, named at this time WCW Mayhem 2, will only be out for PSX and PSX2. Around August there will be a different WCW game entitled WCW Nitro 2000 out for PSX, which will come out in October for N64 and DC. That's all I know for now." Also i mention before about FREE DSL,many people have e-mailed me telling me the signed up and i am happy the did because the earlier you sign up the faster you will get FREE DSL. To sign up click on the free dsl link and download the winfire, the link in on the top frame. 3/1/2K- It'offical people. 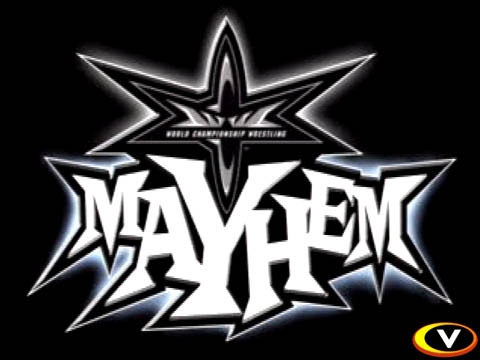 WcW Mayhem 2 is coming to Playstation 2. Check Gameinformer. The have 3 screen and a little detail. 2/20/2K- Since their is no news on WcW Mayhem. Just though i would pass the following on to you. As you all know, i tell people about free offer and service that pay you to be on the web. Well i just found something new. What these people do is pay you for every e-mail you read. That's tight PAY YOU. To sign up go to http://www.sendmoreinfo.com/id/440402 You might want to pass this on to your friend, and family. 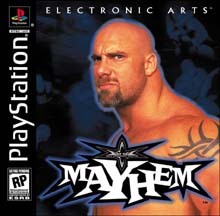 1/19/2K-I got the correct e-mail address to send suggestion for WcW Mayhem 2, it's mayhem@kodiakgames.com. I know a lot of you want the game to be like Wrestlemania 2000, so tell them that. Tell them everything you want to be in the next game. Make your e-mail long and full of good suggestions. Also for all you WcW Fan, i have some bad news, It seem that Vince Russo was fired and many wrestlers was upset, some ask for their release from WcW, these wrestlers include Kidman,Chris Benoit,Saturn, Dean Malenko,Juvi and more. Check the Discussion Section for more, i have posted an article on this. Keep clicking on the links in the top frame if you want to keep this page running. 1/13/2K-Big news. The will be a WcW Mayhem 2. That right another WcW Game. Check out the new at IGNPSX. Also i send some suggestions to webmaster@kodiakgames.com. But the mail came back. So i don't know if that happened to anyone of you. Just keep sending your suggestions and let me know if your mail return or not. 1/12/2K- What do you want to be in the next WcW game? Well send all your suggestions to webmaster@kodiakgames.com. Send all your suggestions now. Everything you want to be in the next game. 1/6/2K-Sorry no update. Please if you will like to see this site up please click on the banner. I have posted a new link to Gamecave, check it out. The sell games very cheap, that where i buys all my game. I think the have the lowest price on the net. Plus the sell import games too. So click on the link in the top frame. 11/2/99-Sorry for such a late update but i don't have nothing to update on Mayhem. I am sure you all know the PPV code, anyway here is the code for WcW last PPV is "@KcXKF=W?j^pF" . Also EA is upset about Mayhem sales, the lost a lot of money on this game, so i don't know if the will be a Mayhem 2 or not. Keep posting messages in the Discussion Forum, you can post anything you want about wwf, ecw, wcw. I will also be posting new issues of TRN at least once a day, in case you don't know what that is, it's a newletter with all the inside information in wrestling, secrets etc. It pretty good,you get to know things before the happen, so keep checking the Discussion Forum. 11/4/99-There is really nothing to update on WcW Mayhem. Anyway if you are having problem signing up for Value Pay, keep trying because it's worth it. Also i found a little file on the Internet that pretty cool, it read your mind, so download it here.. Don't forget to post something in the Forum and check out Mayhem 2 Page. 11/2/99-Added a new Discussion Board. It way better than the last one has some cool new options and you can post anything you want so get over there and start posting. Don't forget to tell me what you think of the new board, if you have any suggestion/comments send them to Asarjoo@netzero.net.. Also found a page that has some information on WcW Mayhem 2. If you find any information in the game please post them in the Discussion Forum, you can also post your wishes for the next game and i will try and send them to EA. 10/30/99-It seem that a lot of people don't know the right way to reverse moves in WcW Mayhem. Well it pretty hard. To reverse moves hit the same button your opponent is hitting to do the move, you can reverse it. Say he is doing a move that end with square or B you hit that button, it very heard but not Imposssible. Also added a new Poll and something else in the Poll Section. 10/28/99-I am pretty sure that most of you heard about a game coming out called WcW Live Click here. Well that a Rumor although THQ had been making the game, the run out of time and EA got the license. Some people said the game will be released in Japan but i e-mailed THQ and the said that the game will not be released in any part of the world the project was scraped. Also i found a very good WWF Smackdown page , it had a lot of new on the game, with a very good Q&A and best of all a Suggestion Board where you can post your suggestion and the owner will send them to THQ. 10/26/99-My site had been Hacked, so some of you could not access it. Anyway for new today if no of you know the have been a move list posted at gamefaq a long time ago. The guide is pretty big so thank the author for that. 10/23/99- Nothing much just made some correction on the Cheat codes. Also as much as i like WWF, i have decide that i will not make a WWF SMACKDOWN page because it too much work. I will make a page those on the next wcw game. 10/21/99-Added back the Old Creation Forum It'smuch better. Also i added a new PPV code for a Thunder match line up I have tested this code on the PSX Version Of Mayhem so i am not sure if it works on N64. If you have any cheat codes or PPV codes please send them to Asarjoo@netzero.net. Also no one has been posting any new topic in the Discussion Fourm this guy created a new board and everyone left so i ask you guy a favor get the Board going again. 10/15/99-The PPV Code has been released for WcW Next Pay-Per-View Halloween Havoc so check the PPV section now.. Also the have been no creation in the Creations forum, if the is anything you would like me to change E-mail me at Asarjoo@bigfoot.com . 10/14/99-Added a new Creation Board. You will be able to Search For Message on the Board which makes it easier to find Creations, BUT the Tripod banner keep popping up every time you try to post a message or search so i suggest that the first time you come to this page or the Creation's Page minimize the pop up window in that way it will not pop up. 10/11/99-Check out Serg New. It has all the new and Rumors about WcW Mayhem and WcW Mayhem 2. Also i am getting alot of mail from a loser marco@eureka.lk telling me a whole bunch of Trash. Oh there another guy Chrisdbz23@aol.com he is my cousin and he is pretty cool he like Wrestling Games too. So when you have time drop him an E-mail. 10/4/99-Added some new codes. Tell me if the work. Also finally found a FAQ so check it out. Thanks for wcw-mayhem.com for posting it. 10/1/99-Got a lot of E-mail , people telling me to update, but there is really nothing t update on, I am still look for a Guide for the game ,if you found one please send it to me at Asarjoo@bigfoot.com . Most of you may have already know this , the will be a Live Pay-Per-View called WcW Mayhem check the details here.. Also there is someone is the Discussion Board claiming to be an EA. rep., I don't believe he is maybe someone is pretending to be an EA. rep but he said that to give him ideas what you want to be in the next EA./WCW game, well I don't believe he is an Ea. rep but still check it out you might have to search for the message because it was posted awhile ago. 09/27/99- I have added a Creation Board. So go post your creations. Sorry the Q&A wil be closed for now until i get more time to start a new one. Don't forget to Join Alladvatage People. 09/25/99- I have added some more codes in the Secret Section. Thanks goes to SPORT126@aol.com and the rest of the people for bring them to my attention. I am not sure if the work but try them and E-mail me if the do Asarjoo@bigfoot.com . Videogames.com had added there Review for mayhem for both the PSX and N64. I am looking for a Mayhem guide, so the should be one soon. I would like to Thank You all for visiting my page i have got alot of visitors considering that when you visit this page no mater what other page you go to Secrets etc. it counts as one hit. Tripod has also Promoted my Site, the have some new service I can use like more Disk Space Etc. And it free as long as I get 100 hit a day, so I would need your help, tell all your friend about my site. Thanks you. 09/24/99- I got alot of E-mails from people telling me the code to get all the wrestler does not work. 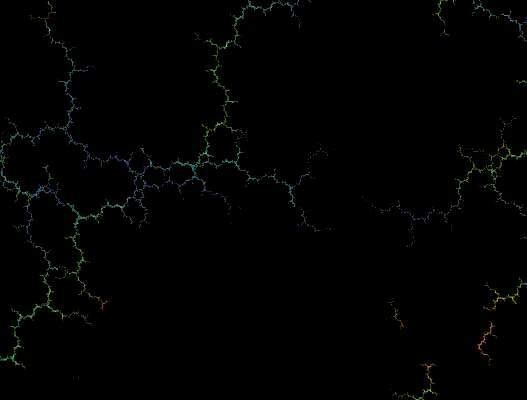 Well i have updated the code.Check the Secrets section for the real code. Also if anyone has a Review please send them to me i am working on a Review Section, so send them to Asarjoo@bigfoot.com .I am also working on a Creation forum. I have told alot of you about alladvatage. Alot of you don't believe but the do pay you to be on the net, all you have to do is display a banner everytime you are online, i am using them and making money there is no fee you join for Free. Also when tou join don't foget to put in my referral id BDA-742. 09/20/99- A new page of Q&A'S is up. WcW Mayhem is almost here so you should order your copy now, i think there 2 more days until mayhem arrives. Check below for the links to order at lowest price . Don't forget to Join Alladvantage the pay you to be on the net, you can't beat that. 09/19/99- Q&A is updated. Don't forget to join the Alladvatage program. 09/16/99- Q&A 4 is up. Also i joined the AllAdvantage Program, it pretty good the pay you to be on the internet . So go there now and don't forget to put in my Referral ID BDA-742 when you sign up. 09/15/99-Part 3 of my Q&A is up. Don't forget to pre order WcW Mayhem. Check below for the lowest price. 09/14/99-Part 2 of my Q&A is up. So check that out and if you would like to submit a question that you want to be in the Q&A section E-mail at Asarjoo@bigfoot.com and put Q&A in the subject line, if you don't i will just reply to you. Also Sign My Guest Book Everyone. Thanks alot. 09/13/99-The Q&A section has been updated. I have Added some new Q&A so check them out. 09/11/99-Finally I have found a cheat code for WcW Mayhem, check out the Secrets Section for it. Videogames.com has added another entire of there Designer Diary.I have just started may own Q&A Section, so send in your questions to Asarjoo@bigfoot.com. Note:Alot of you who joined my mailing list did not rejoin the new mailing list which mean that you will not receive any updates, so once again join the new Mailing list. 09/07/99-Added Preview of WcW Mayhem from EGM . Also added Pics of some wrestlers finisher. Also everyone who joined my mailing list will need to rejoin the new mailing list just go to the mailing list section and rejoin. 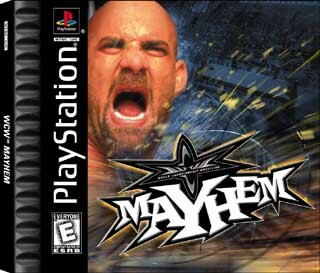 09/03/99-WcW Mayhem has gone Gold for the Playstation, which mean that it has been approved by Sony and is on it way toward Manufacturing and Packaging. The game will be out september 24. Also here is the final Box Shot of the PSX version. As soon as i get info on the N64 version release i will post it. 09/02/99-Updated the Feature Section. I have added all the stuff you can do in the Create a Wrester Mode and more. So check it out. Note: There is no steel cage match or blood in the game, just wanted to clear that up. 09/01/99-Nothing much to update,just added some new polls in the Poll Section. Also if you did not pre-order WcW Mayhem, Now is the time check out below for link to the lowest price on the net. 08/31/99-Some correction for the GI Q&A the links I posted was for the old Q&A check the new one at GI Q&A, it also have list of all the old one's too, so any you missed it now time to catch up. Sorry for any inconvenience it may have caused you. 08/30/99- Nothing much to update today. Just added pic of the box shot of WcW Mayhem for both system. Important note: If you E-mailed me or join the mailing list between Friday and Saturday and I did not reply to you please send back the an E-mail.or if you joined the mailing list rejoin. Sorry for the inconvenience. Don't forget to pre-order WcW Myahem(check at the bottom of this page for lowest price) and keep check the GI Q&A. 08/27/99-Not much update, only GI Q&A. Check back soon for my updates. 08/24/99- The WcW Mayhem Designer Diary has been updated. Check out the latest scoop about WcW Mayhem Here. Also the Official WcW Mayhem Page has been updated. Don't forget to pre-order WcW Mayhem, check at the bottom of this page for the lowest price on the net. 08/19/99- GI Q&A has been updated. Also i have updated the Wrestlers, and Game features. And don't forget to pre Order WcW Mayhem Check at the bottom of this page for links to the lowest price on the net. 08/17/99-Not much update. Just an Interview with Ryan Mc Donald from videogames.com . Check back in the week for part 2 of that Interview. And don't forget to pre-order your copy of WcW Mayhem scroll down and you will see link to the lowest price on the net. 08/12/99-GI Q&A has been updated so check that out here. Also i have updated the Wrestlers in the game click here to go there. Also Videogames.com has updated there preview with some new screens . Check N64 preview and PSX Preview. One last thing the N64 version of the game is finished and PSX version is almost finished! !So you better Pre-Order your copy check at the bottom of this page to link to the lowest price on the net. 08/11/99- GI Q&A has been updated so check that out. Also IGN64 has 100 pics of WcW Mayhem so check it out. 08/10/99- Added WcW Mayhem AD from PSM magazine. Also the ad said that the release PSM release schedule said the game would be release 4th quarter of 1999. But i think that wrong. 08/08/99- Added some new pics. Also check out this Article from IGN. Don't forget to pre-order WcW Mayhem!! Check out the links below for the lowest price on the net.